Robert Paxton McCulloch was a skilled Stanford University engineering graduate who inherited a considerable sum of money from his multi-millionaire grandfather at an early age. This gave him the financial freedom to indulge in two of his passions, boat racing and engineering, which eventually led to him becoming a national champion in classes C and D of outboard hydroplanes in the1930’s, and the also saw him set up a machine shop, where he and his helpers made engines for midget racers, and ended up building a twin motored, four wheel drive, midget that was so fast that it resulted in the ban of this type of midget from the tracks. Search for more speed resulted in him using his inheritance to set up the McCulloch Engineering Company in which he employed a team of engineers to develop engines and superchargers for aeronautical and automotive applications. The first product of the McCulloch Engineering Company was a 2 stroke 60 cubic inch 90 HP racing engine developed by Robert P McCulloch, Gerald C Robechaud and Milton Hoeppner. Another product developed at McCulloch Engineering by Francis L. Colburn was a centrifugal supercharger for the Flathead Ford V8. 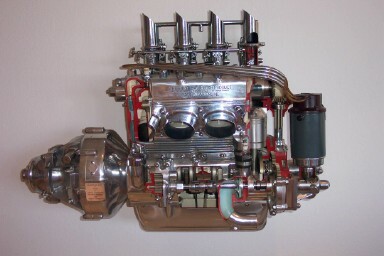 The Flathead Ford V8 was an enormously popular power plant at the time, and a low cost centrifugal supercharger developed for this engine had potential for high sales. 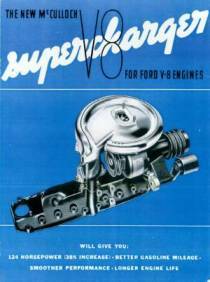 The resultant supercharger was belt driven, was horizontally mounted between the standard intake manifold and carburetor, and may well have been one of the first aftermarket blower systems produced. 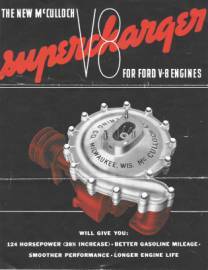 McCulloch Engineering Company was based in Milwaukee, Wisconsin and the Flathead supercharger unit was manufactured and sold between 1937 and 1940, and was significantly different to the later McCulloch blow through centrifugal superchargers in that it was an inline unit, which compressed and mixed the fuel/air charge. It consisted of an impeller, which turned at six times the engine speed in the impeller housing, and was driven by a set of worm gears mounted on the drive shaft and rotor shaft. The worm gears were driven by a triple pulley mounted an input drive shaft driven from the crankshaft pulley using several belts and were initially lubricated using engine oil under pressure from the engines oil system. By revolving at high speed the impeller caused the fuel/air mixture to build up pressure, up to a maximum of four pounds, within the impeller housing as a result of centrifugal force, and the pressurized mixture was discharged into the inlet manifold. There appears to have been two versions, one without a water jacket, and the other with a water jacket around the impeller housing which was used to warm the air/fuel mixture and was purported to aid low speed performance. A special three/four belt crank pulley was furnished for the Ford crankshaft, two new water pumps with three belt pulleys, as well as a set of matched V belts, a belt idler pulley and a special air cleaner which was required due to the reduced clearance added by the supercharger. The initial units, manufactured in 1937 and retailing for around $85, were designed to bolt onto the existing Ford and Mercury V8’s which had the water pumps attached to the cylinder heads. Continuous improvement by the McCulloch engineers resulted in a modified version being introduced in 1938, retailing for $125, and which was also engine oil lubricated via a supplied intake manifold, which contained all the necessary link ups required for the engine oil lubrication. These also appear to have been offered with in water jacketed and non water jacketed versions. In 1939/40 thermostatic control of the exhaust gas through the impeller housing was introduced, in order to promote a rapid warm up of the fuel/air charge output from the blower. 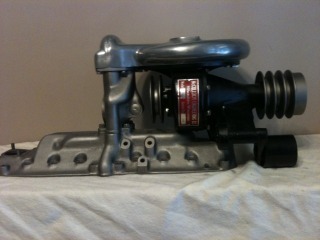 These Flathead superchargers were designated with a model number that correlated the year of manufacture against the intended application vehicle (M for Mercury and F for Ford). Hence 38F refers to a 1938 model intended for a Ford. The supercharger, which may also have been used as OEM on the Graham-Paige, was purportedly popular with Truck owners due to the increased torque and low atmospheric pressure performance that it gave. McCulloch advertising of the period claimed a 38% increase in Horsepower, better gas mileage, smoother performance and a longer engine life. More than 5,000 of the superchargers were sold during the late 30’s, but production was discontinued during the early 1940’s due to two reasons. The impeller for the supercharger, being gear driven, and being lubricated via the engine oil system which was often not changed as regularly as it should, had a tendency to become quite noisy with wear, and the blower, due to it’s fixed ratio of 6:1, produced no significant boost until high rpm was being achieved by the engine with boost levels being no more than 4 psi, even with radical reworking. These facts failed to impress the general public, and sales were low, although by the early 40’s this had became irrelevant as McCulloch was making superchargers for all purposes, and many thousands were manufactured for military equipment used during the Second World War. In fact McCullochs total sales in 1942 were $3 million, and the only larger manufacturer in the supercharger field at that time was General Motors. The success of McCulloch Motors, and the restless nature of Bob McCulloch, resulted in him selling McCulloch Motors to Borg Warner in 1943 for $1 million , which was subsequently invested in Pan American Airways stock. Six months later some of the stock was sold off and Bob McCulloch set up McCulloch Aviation Incorporated to manufacture 6,000 drone plane engines for the, based upon earlier lightweight two-cycle engines designed by McCulloch, for the Army Air Force. As a result of this contract McCulloch felt that his future lay with featherweight two-cycle engines for Industrial use, and given that it was time for a change, and his current manufacturing facilities were not suitable, McCulloch uprooted McCulloch Aviation and moved it to California. Word of caution about buying one of these. Although rare to find and more rare if the set includes the water pumps, pulleys and all the required parts to make it work on your Flathead. Make sure it spins free. If the main Impeller shaft is bent the Supercharger is a very expensive wall hanger. As replacement parts are beyond difficult to find and so far I can’t find anyone that actually works on these. 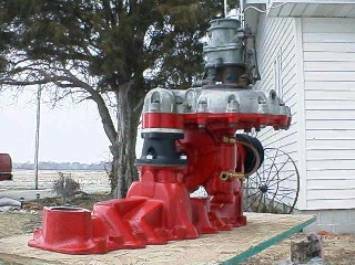 Current market price on this intake by it’s self is in the $2-3000.00 range. More if it includes the Pumps, pulley’s and everything you need to install it. I have seen a number of sellers asking North of 5-10K for this setup. Just walk away. Word of caution about buying one of these. 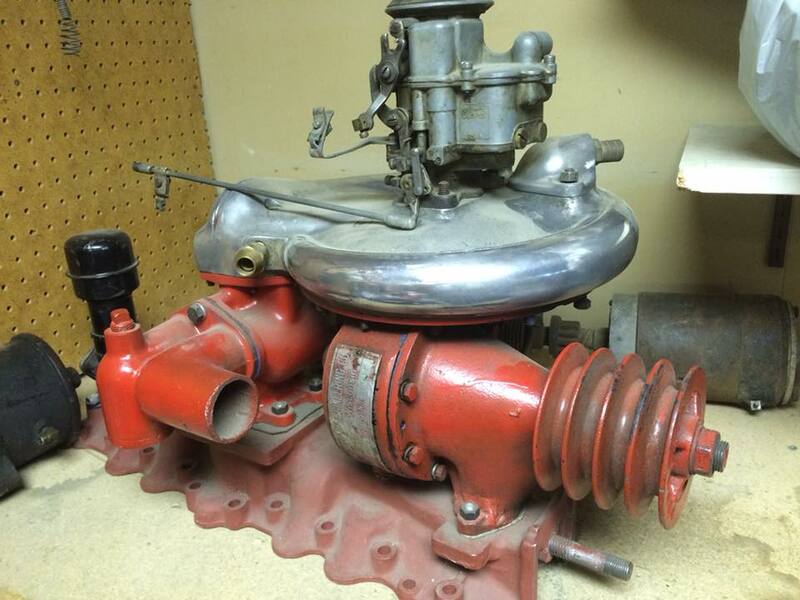 Although rare to find and more rare if the set includes the water pumps, pulleys and all the required parts to make it work on your Flathead. Make sure it spins free. If the main Impeller shaft is bent the Supercharger is a very expensive wall hanger. As replacement parts are very difficult to find and the shaft is brass.